Guitar cable and for other demanding connections. It is very flexible, oil resistant, acid resistant, heat and coldness resistant, caused to a caoutchouc share in the PVC. 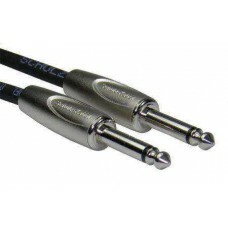 high quality SCHULZ cable SFI 105 (1x0,5 mm²) 2x Neutrik NP 2 CBAG mono plugs (6,3 mm) length: 3 m.. Guitar cable and for other demanding connections. It is very flexible, oil resistant, acid resistant, heat and coldness resistant, caused to a caoutchouc share in the PVC. 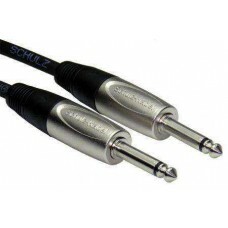 high quality SCHULZ cable SFI 105 (1x0,5 mm²) 2x Neutrik NP 2 CBAG mono plugs (6,3 mm) length: 6 m.. 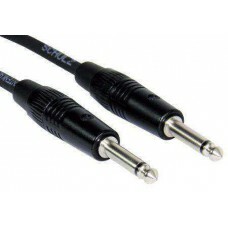 Audio cable SCHULZ cable IK 6, flexible braided shield, OFC, noiseless outside diameter 7 mm, 1 x 0,22 mm² Two 6,3 mono plugs S 8 - Made by Neutrik - length: 6 m.. 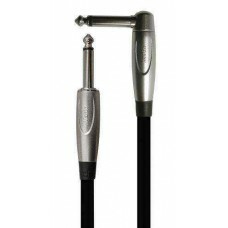 Guitar cable 3 m high quality SCHULZ cable IK 5, flexible braided shield, OFC, noiseless, conductive TPE outside diameter 6 mm, 1 x 0,2 mm² angled plug, mono 6.3 mm, MARTIN S 280 to plug, 6.3 mm mono, Amphenol S 673.. 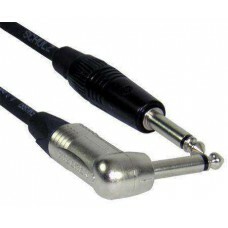 Guitar cable 6 m high quality SCHULZ cable IK 5, flexible braided shield, OFC, noiseless, conductive TPE outside diameter 6 mm, 1 x 0,2 mm² angled plug, mono 6.3 mm, MARTIN S 280 to plug, 6.3 mm mono, Amphenol S 673.. Audio cable for demanding connections. - 6 m high quality SCHULZ cable IK 5, flexible braided shield, OFC, noiseless, conductive TPE outside diameter 6 mm, 1 x 0,2 mm² angled plug, mono 6.3 mm, Neutrik NP 2 RX to 1 plug, 6,3 mm mono, Neutrik NP 2 CBAG.. Guitar cable and for other demanding connections. high quality SCHULZ cable IK 5, flexible braided shield, OFC, noiseless, conductive TPE outside diameter 6 mm, 1 x 0,2 mm² 2 Neutrik metal plugs 6,3 mm, mono, NP 2 CBAG length: 3 m.. Guitar cable and for other demanding connections. high quality SCHULZ cable IK 5, flexible braided shield, OFC, noiseless, conductive TPE outside diameter 6 mm, 1 x 0,2 mm² 2 Neutrik metal plugs 6,3 mm, mono, NP 2 CBAG Länge: 6 m.. Guitar cable and for other demanding connections. Noiseless because of the conductive PVC. 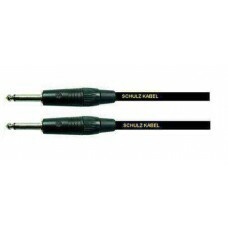 High quality SCHULZ Kabel IK 5, flexible braided shield, OFC, noiseless, conductive TPE outside diameter 6 mm, 1 x 0,2 mm² 2 plugs 6,3 mm, mono, S 1..